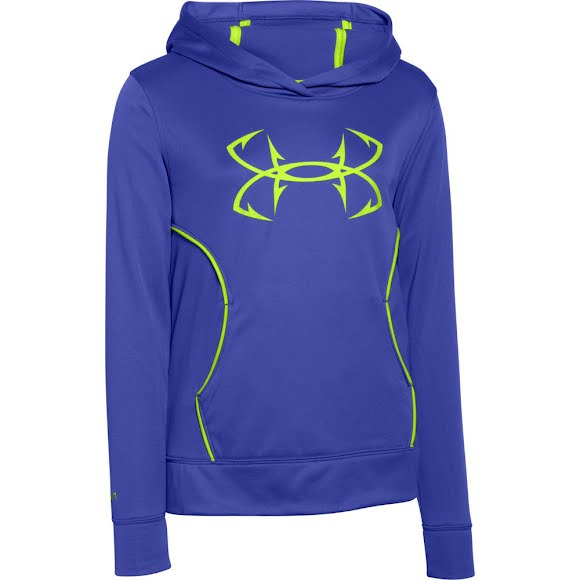 With a loose, generous, more relaxed fit, the Under Armour Girl's Youth Fish Hook Fishing Hoodie features Storm 1 technology, Armour® Fleece construction, and the innovative Signature Moisture Transport System to keep you as comfortable as a dry fly. With a loose, generous, more relaxed fit, the Under Armour Girl&apos;s Youth Fish Hook Fishing Hoodie features Storm 1 technology, Armour® Fleece construction, and the innovative Signature Moisture Transport System to keep you as comfortable as a dry fly. Water-resistant finish repels water without sacrificing breathability. Remains soft and flexible for superior mobility. Best for light rain.